Just ten games into the season, the Chicago Cubs lost their ace pitcher, Jon Lester, to the disabled list with what the team described as a hamstring strain that he suffered during their home opener against the Pittsburg Pirates. A magnetic resonance image (MRI) is expected to confirm the diagnosis. Lester doubled in the second inning and then scored on a single by Ben Zobrist. However in the process of running home from second base, Lester reported he felt discomfort in his left hamstring. Lester threw three pitches the next inning before Manager Joe Maddon went to his bullpen. “The worst scenario would have been to leave him in to try to work through it and get hurt worse,” the Cub’s skipper said in an after-game interview. He added the Cubs were going to take a conservative approach and not set a time table for Lester’s return to the rotation. According to Dr. Steven Chudik, orthopaedic surgeon and sports medicine specialist at the Shoulder, Knee and Sports Medicine Injury Clinic in Westmont and Western Springs, Illinois, Lester’s MRI results should confirm the severity of his hamstring strain and help determine how many starts he misses and the amount of rehabilitation he will need to return. “The best scenario for Lester and the team will be if the MRI shows he suffered only a mild strain,” Dr. Chudik said. “However, even that can sideline an athlete for at least a couple of weeks and re-injury rates are high so it is important to properly manage the injury so it doesn’t not become a chronic or recurrent issue,” he added. Although Dr. Chudik is not treating Lester, he has seen and treated hundreds of similar cases during his 20 years of practice on both competitive athletes participating in sports and the recreational “weekend warriors.” Dr. Chudik explained a previous injury is the greatest risk factor for another hamstring strain and re-injury rates are reported to occur 30 percent to as high as 60-70 percent in some studies. “The most common mechanism for athletes to strain their hamstring muscle is while sprinting or kicking,” Dr. Chudik said. “As the leg swings forward rapidly with kicking or sprinting, the hamstring fires eccentrically to slow your leg down at the end of the stride or kicking movement. The powerful eccentric contraction (elongation) of the hamstring muscle typically results in a strain (tear) at the muscle tendon junction with limited separation, bleeding and inflammation at the site,” he added. Other factors can contribute to a hamstring injury including not warming-up adequately or properly, cold weather, muscle fatigue, poor flexibility, poor body mechanics or overstretching it because of a fall. Most hamstring strains heal and recover with rest and physical therapy. As with any injury, if it does not improve within a week or if any symptoms worsen, the injury should be examined by an experienced medical specialist like Dr. Chudik. 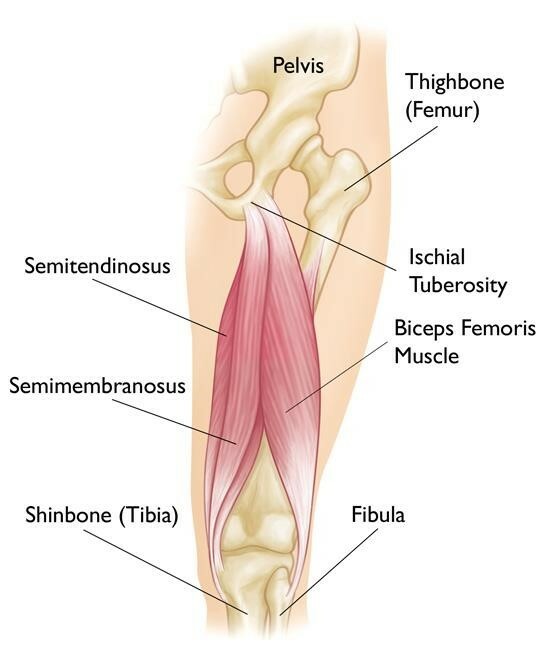 A proximal hamstring tendon avulsion of the muscle attachment to the pelvic bone often requires surgery within a few weeks. Delays in a diagnosis can result in retraction of the muscle, inability to primarily repair the tendon and permanent pain and hamstring dysfunction that prohibit running. There is not any indication that Lester sustained a tendon avulsion injury. To learn more about hamstring injuries, prevention and rehabilitation, read this article published in the Orthopaedic Surgery & Sports Medicine Teaching & Research Foundation’s (OTRF) e-newsletter and an educational handout from Dr. Chudik available on his website.